Democracy: The people remain the “appropriating body” of the town and retain exclusive authority to decide budgets and taxes. All voters have an equal opportunity to participate, regardless of health issues, child-care issues, work issues, etc. Efficiency: People can vote by briefly stopping at a polling place at any time during Tuesday. Absentee Ballots: The FTR provides for the Board of Canvassers to implement absentee ballots so that those out of town, in the hospital, home bound, etc have the opportunity to vote. Simplicity: People can advocate and vote for their preferred budget proposal at the Financial Town Hearing (FTH) and FTR without procedural matters and confusion that accompany Robert’s Rules of Order. Certainty: The Board of Canvassers has jurisdiction over the FTR and using the normal voting process assures an accurate vote count. Access to Ballot: The Budget Committee recommendation will appear on the ballot. Municipal and School budget requests may optionally appear on the ballot. Electors will also have access to the ballot via Elector Petitions requiring just 50 signatures. Informed Decision: All budget/tax options on the ballot and the Budget Committee’s recommendations will have been discussed/vetted at a hearing two weeks prior. Voters will have ample opportunity to find out all implications of each plan, and two weeks is long enough for the local news cycle to inform. Confidentiality: People can vote their conscience on budget and tax matters in privacy as they do in elections. Finality: The town’s budget and tax-levy will be definitively set by the FTR, unlike the FTM which can go on indefinitely without resolution. Practicality: As with any election, all of Tiverton’s 11,000 plus voters can vote in the FTR with minimal consideration for facility capacity or comfort. People would go to the Town Hall, and any other polling place the Board of Canvassers may designate, and vote by secret ballot, in a voting booth, the same as they do in any general election. The budget proposals that appear on the ballot would be the same proposals presented, explained, and discussed two weeks prior at the Financial Town Hearing. The FTR authorizes the Tiverton Board of Canvassers to implement absentee ballots so that people who are sick, out of town, or home bound can vote in the FTR. This is in sharp contrast to the FTM where the only way to vote is to be present at the four hour meeting. FTM – The Financial Town Meeting which is Tiverton’s current method of approving budgets and property taxes. FTMCAC – The Financial Town Meeting Changes Advisory Committee was established by the prior Town Council in 2010 to study and prepare a proposal to replace the FTM. The current Town Council reauthorized and extended the FTMCAC. The FTMCAC worked for nearly a year, held over a dozen public meetings, and documented over 130 feedback topics to develop the current FTR proposal. The 6 members of the FTMCAC unanimously recommended the FTR proposal to the current Town Council. FTR – The Financial Town Referendum is what would replace the FTM. Tiverton’s budget and property taxes would be determined by vote of the people of Tiverton, voting by private ballot at any point during the day. Alternatively, voters could vote by absentee ballot. FTH – The Financial Town Hearing is the open public hearing which would happen 2 weeks before the FTR. No later than 14 days prior to the FTR the Financial Town Hearing (FTH) shall provide voters and the government an opportunity to review and equitably debate all budget proposals and resolutions as they will appear on the ballot for the FTR. The FTH agenda shall include, at a minimum, a line item for the presentation of the Docket by the Budget Committee or representatives thereof, line item(s), if any, for the presentation of additional Budget Proposal(s), and line item(s), if any, for Resolution(s). The FTH shall, at a minimum, be attended by representatives from the Town Council, Budget Committee, and School Committee. Attendance by Budget Proposal and or Resolution Petition Originators or representatives thereof shall be optional at his or her discretion. Via the FTH all budget/tax options on the ballot and the Budget Committee’s recommendations will have been discussed/vetted at a hearing two weeks prior. Voters will have ample opportunity to find out all implications of each plan, and two weeks is long enough for the local news cycle to inform. That is correct we do have a public hearing before the FTM now. The FTR is designed to emulate the best parts of the ‘FTM and this is one example of that effort. The voters will have the added benefit [over the FTM] of being able to view the actual proposed budget and all proposed amendments prior to casting a ballot. This is a significant improvement over the current process. Although exact costs to run the FTR have not been tabulated, it is safe to say that the cost to run the FTR will be SIGNIFICANTLY LESS than running an FTM. For a detailed justification of this claim, please see the last entry on the FTR vs. FTM page. A run-off vote would only occur if no budget proposal on the ballot at the Financial Town Referendum receives a majority vote. In that event, the two budget proposals that received the highest number of votes at the FTR would be on the ballot at the Run-off election which would be held two weeks after the FTR. At the run-off election, the proposal that received the most votes wins. This Run-off vote option guarantees both finality of a budget proposal, and a majority vote in favor to the budget proposal. Yes. The ability for an elector to originate a budget proposal is a substantial component of why the FTR meets the needs of every Tiverton voter. If after the Budget Committee, and optionally the Town Council and or School Committee, publish their Budget Proposals an elector is not able to support any of the ballot options, then he or she can originate his or her own Budget Proposal for placement on the ballot with just 50 signatures. In this way and in sharp contrast to the FTM process, not a single Tiverton voter will be disenfranchised by the FTR process. The more signatures that are required, the harder it is for a citizen to get their proposal on the ballot. On the other hand, the requirement to get 50 signatures (which usually takes 1-3 hours for most people) helps make sure that the petitioner feels strongly enough about his or her proposal, and also that some measure of support from the community is demonstrated before it goes on the ballot. While the Financial Town Meeting Changes Advisory Committee considered and debated if 50 is too low of a number, bear in mind that currently our charter requires 50 signatures for a voter to put written financial resolutions or additional financial proposals before the FTM voters right now. It’s better to err on the side of allowing more people the chance to participate. If it turns out that “too many” people are putting ballot proposals on the ballot, the threshold can always be changed by charter in the future. 11. Do the School Committee and the Town Council have access to the FTR ballot? Absolutely. Just like now with the FTM, the School Committee and Town Council each submit their budget requests to the Budget Committee for review, and the Budget Committee generates its own recommendation. With the FTM now, the School Committee and Town Council each have the opportunity to amend the Budget Committee’s motion verbally in real-time at the high school gym. The problem with that is that Tiverton residents may have little (or no) warning of what those amendments might be to help decide how to vote at an FTM, or whether to even go at all. With the FTR, the path is similar except that the School Committee and Town Council (if they are unhappy with the Budget Committee’s recommendation) have access directly onto the ballot for their requests. Most importantly, the voters of Tiverton will know well in advance what those requests are, and will also have the opportunity to consider/debate those requests at the Financial Town Hearing and then have another two weeks to consider before the actual vote. No more last minute “emergency” meetings or behind-the-scenes action to come up with surprise amendments, and no more trying to make a split second decision on the high school gym floor. Under this FTR ballot access provision the School Committee would specify both its budget and its “education aid” amount. Similarly under this provision the Town Council would specify its budget and the amount of non-tax revenue exclusive of education aid. Unlike the FTM, the FTR authorizes the Board of Canvasses to implement absentee ballots. During discussions at FTMCAC public meetings, the Clerk of the Board of Canvassers discussed having a voting machine set up to receive absentee ballots for say a week in advance of the FTR. In this way voters who would be out of town or unavailable to vote on the day of the FTR would have the opportunity to vote prior to the FTR. This is a significant improvement over the FTM where the voter must be present during the meeting to vote. The Financial Town Meeting (FTM) is the legal authority currently used in Tiverton to appropriate budgets and levy taxes. Specifically, Tiverton voters gather on the second Saturday in May between 9AM and 1PM and approve budgets and taxes. If the business is not complete in the four hours, the meeting is continued until the next Saturday (this happened in two of the last four years). The FTM adopts its own procedural rules which overlay Roberts Rules of Order. The FTM is held in the Tiverton High School gym. If the gym fills to capacity then the Tiverton High School auditorium is used for the overflow. The high school gym can hold about 1000 people. First, the moderator calls for a voice vote. This often results in shouting which disadvantages older voters who simply cannot shout as loud as a younger voter. If the voice vote is ‘close’, the moderator then asks for all voters in favor (or not in favor) to raise their hands. Then counters, who are volunteers and may be biased, use hand held tally counters to count the raised hands. There have been times when whole sections of voters claim to have not been counted, and other times when the vote total added up to more voters than were in the room. There have been many recounts as well, which are time-consuming. However, the most important drawback to voting at the FTM is that it is in public and significant voter intimidation is present. The FTM has no voting privacy: At the 2010 FTM there was a group of people who all wore red T shirts and sat in the bleachers watching, photographing, and filming other voters on the main floor, most of whom who were in opposition to them. Often times parents are afraid to vote their beliefs because they fear retribution against their children by the public school teachers. There is yelling and booing, etc. which is very intimidating to a voter, who, for example, is there all alone, or who is already confused by the FTM’s many procedural rules. Also in 2010 the police were needed to diffuse the red shirts who surrounded and shouted insults at an elected official. In summary, those who stand to benefit the most by the passage of a budget often use coercion during the FTM and its voting process to ensure their budget passes. This flies in the face of a voter’s right to privacy. The Tiverton Town Charter requires that in order for the FTM to conduct business 301 voters must be present (a quorum of 301). In some years (such as 2011) when there is little controversy about budget and tax amounts a quorum may not be present. In this case the FTM cannot begin until enough people arrive to the meeting. Often the Town Clerk uses a cell phone to call voters to attend the meeting. It goes without saying that such a lack of a quorum leads to a delay in the start of the FTM for all those present. From the 2008 FTM, a taxpayer suit claimed that the Town Council did not follow state law to break the cap by not taking a required supermajority vote and by improperly claiming non-property tax revenue losses, that the Budget Committee held an illegal last-minute meeting and then made a surprise motion to overturn the first FTM vote where the people voted down an 11% tax increase by a 2:1 margin, that procedural rules were not followed, and that town officials misled the people. The Town tried unsuccessfully to have the case thrown out. After the somewhat similar 2010 case was brought, the 2008 case was dropped. The 2008 FTM also led to a complaint that a teller was double-counting votes after there were more votes counted than people in the room. The Board of Elections refused to hear the complaint because elections law does not apply to FTMs. The Town Council (at that time) denied the local Board of Canvassers their request for independent legal counsel, thereby blocking any further investigation. Another complaint involved the School Department using the children and the school messaging system for political purposes. The School Department (at that time) refused to investigate the matter, leading to a citizen charter change petition which now expressly prohibits the use of town resources to impact a voting contest. From the 2009 FTM, the School Committee sued the Town because of a dispute over whether the voters chose to automatically make up any shortfalls in state aid to schools, and whether they even have the authority to vote on state aid. The case also disputes the handling of tuition money paid by the City of Fall River. There was a split decision by the Commissioner of Education and appeals before the state Board of Regents are now pending, with more appeals to the state Supreme Court thought likely. From the 2010 FTM, taxpayers again brought suit, alleging that the Town Council again failed to follow the law to break the state tax cap, in that it did not apply for a waiver in advance of the FTM with notice to the people, again did not take a supermajority vote to approve breaking the tax cap, and that the then Town Council president without authority from the Town Council moved the FTM to break the tax cap. This case is pending in Newport Superior Court. Because the case has some similarities to the 2008 case which the court would not throw out, it is widely expected that the 2010 case will go to the Supreme Court if the FTR does not pass on November 8th. From the 2011 FTM, litigation has been threatened again by the School Department after the FTM voters expressly resolved they would not automatically make up state aid shortfalls. Others have threatened suit because the School Department’s portion of the budget from local taxpayers broke the 4.25% state tax cap. These complaints overlap to some degree with the ones from 2008, 2009, and 2010 which all remain unresolved. 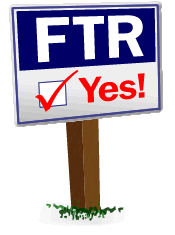 Virtually everyone seems to agree that having an FTR will go a long way to resolving many of the issues causing all of these lawsuits. For example, with an FTR there would always be advance notice of any budget question. No more secret meetings or surprise amendments. Also, the Town Council would be forced to follow the tax cap law. With the same electronic voting used in regular elections, vote counts would be absolutely accurate. There would be no more tricky Robert’s Rules of Procedure, which nobody but insiders can fullly understand, and the budget would be adopted with finality and not Saturday meetings continuing endlessly. The FTR could help heal Tiverton instead of causing it to fight with itself year after year, and save taxpayer money from having their dollars used against them in litigation, or even worse, forcing taxpayers to pay both the town and school attorneys to fight against each other. The quoted cost for an FTM is about $7,000 – $8,000. However, this amount does not include ancillary costs including labor charges from the DPW, Police, Fire, Solicitor, and the school department Janitor, which clearly bring the loaded cost of the FTM well over $10,000. If there is a continued second week of the FTM, then most of the cost components double. For a detailed comparison of FTR and FTM cost drivers, please see the last entry on the FTR vs. FTM page. A special election/referendum is just as easy and fast as the FTR will be. It usually takes less than 10 minutes to check in and vote. Voting is in private. Polling locations are open all day. Yes. Big questions in Tiverton have historically passed or failed on the narrowest of margins. In 1988 the $5 million Industrial Park finance plan passed by a vote of 54 – 15 at a Special Financial Town Meeting – only 69 voters were present at that FTM and they spent $5 million. In 2004, the special election for $30 million in school bonds was decided by a vote of 1292 yes votes to 1219 no votes. The 2009 budget passed by just 5 votes at the FTM. That means if just 3 people had voted differently, the outcome would have been different. As you can see, every vote counts. All registered voters in Tiverton. You can only vote on November 8th if you are a registered voter. Whether or not you work in Tiverton, or own a business in Tiverton, you can only vote if you are registered with the local Board of Canvassers. Anyone, however, including businesses, may help support the FTR by donating to Voters for the FTR. There will be only 2 questions on the ballot for Tiverton voters to decide on Tuesday, November 8th. One asks if Tiverton should replace the FTM with the FTR. The other question will ask if Tiverton will approve bonds for a new library. The two questions are separate, but will share the same ballot on November 8th. The library has also offered to pay for the cost of the November 8th special election. Voters for the FTR believes that supporting the FTR is a top priority to stabilize and secure Tiverton’s future and to allow more people to engage in the process, and takes no position on the library bond. As with all important Town decisions, we encourage everyone to carefully research the facts and consider all positions. Here’s a link to the library’s website. No. Voters for the FTR is not affiliated with the Tiverton Democratic Town Committee, Tiverton Republican Town Committee, Tiverton Citizens for Change, or any other party or group. A broad consensus of Tiverton residents believe that the benefits of the FTR are far better than what we have no matter what political perspectives or preferences one has. We also see the FTR as overwhelmingly positive for our town regardless of whether one fights for higher or lower taxes, but our observation has been that the small numbers of folks who vocally oppose the FTR are the same figures central in the problematic FTMs of recent years. We will speak out against those who want to keep the FTM for no other reason than because they like winning on an uneven playing field. The most important thing to do is to vote on Tuesday, November 8th. Help spread the word with your neighbors. Please click here for other ways to support the FTR.